Gazprom and Russian truck manufacturer KAMAZ have entered a natural gas powered sport truck in this year’s Silk Way Rally. The truck was customized by the KAMAZ Master team with Gazprom’s assistance in order to promote natural gas use as a vehicle fuel. After two days of difficult off-road racing the team finds itself 9th in the overall ranking of truck vehicles after two stages. “This is an interesting project and a wonderful opportunity to promote NGV fuel. It will clearly show that gas may be used not only by conventional motor vehicles, but also by rally trucks,” said Alexey Miller, Gazprom Management Committee Chairman at an inspection of the gas vehicle before the start of the race. The truck’s team consists of Sergey Kupriyanov, Press Secretary of the Gazprom Management Committee Chairman, Alexander Kupriyanov and Anatoly Tanin. 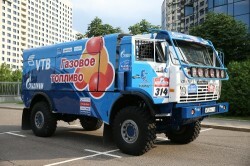 At the end of stage 2, the KAMAZ 4911 is 2h03m51s behind the race leader. The gas equipment installed in KAMAZ showed no malfunction. “Despite great vibrations we had no problems with gas feeding. 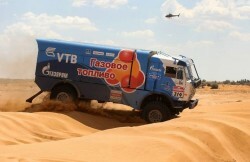 The truck ran smoothly on the race track,” said Sergey Kupriyanov. The 2013 race runs along the Moscow – Tambov – Volgograd – Elista – Astrakhan route with the total length of 4,097 kilometers, including 2,822 kilometers of high speed off-road sections. More than hundred participants from 27 countries worldwide including 26 truck teams compete in the race. The race began with a ceremonial start on July 5 in the Red Square in Moscow, its first stage finished on July 7, the second – on July 8.